30-day money back guarantee! If you don't love the Axe, return it within 30 days, no questions asked. The Axe handle is hailed as a breakthrough by players and coaches from youth leagues to the pros. With an ergonomic design to fit your hands, the Axe handle shape gives you a better grip with less tension and delivers many important benefits through your swing. Our composite technology leverages a single hitting face to deliver more performance and durability than a traditional 360-degree designed bat. By varying the wall thickness and adding slip-planes, we can tune the hitting face to deliver more power while still maintaining durability. 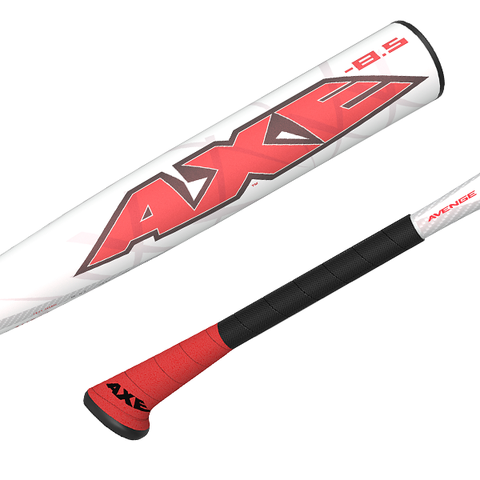 Because the Axe is the only approved bat with an asymmetric grip, our engineers can focus in on a single hitting face. The Engineered Hitting Zone lets us dial in performance and durability like no other bat maker can. L141A-28-19.5: 28 in. 19.5 oz. L141A-29-20.5: 29 in. 20.5 oz. L141A-30-21.5: 30 in. 21.5 oz. L141A-31-22.5: 31 in. 22.5 oz. L141A-32-23.5: 32 in. 23.5 oz.